Is this a film or travel post? To be honest with you, I wasn't so sure either when I planned it. However, as soon as I stepped into "The Making of Isle of Dogs" exhibition I felt immediately transported to a wondrous dream world - but let me start from the top. So *takes a deep breath* after one of these aimless scrolls on Instagram, I noticed a picture posted by my former colleague Ben. In the shot, he had been up close to the puppets of the newly released Wes Anderson film Isle of Dogs. Feel free to judge me, but I'm not the biggest Wes Anderson fan. I do appreciate his artistic work but feel his ideas/visions are a bit too eccentric and absurd for my taste. Anyway, some stalking research later I knew that my colleague had been to a pop-up exhibition showcasing various sets and puppets from the film. And where else would be a better place for something so genius as this? Right, the X Store on 165 The Strand (we remember the legendary LV Series 3 fashion exhibition). The best bit was yet to come - the exhibition was completely for FREE. This was certainly a unique collaboration between the X Store and the distributor Fox Searchlights since pop-up exhibitions revealing insights into the world of film making are rare. I love a good artsy exhibition - may it be film, paintings or fashion collections, I was so up for this. One fine Saturday afternoon after brunch with friends, I went over to the X Store and joined the queue. The wait wasn't too long and after 20 minutes I entered the building. The entrance was plastered with film posters and additional information about the stop motion film. Isle of Dogs was mainly filmed at 3 Mills Studio in East London. Here, more than 17 sets have been created alongside over 1000 puppets and more than 144,000 still frame shots to make the movie. In total, 670 people were involved in the production. Once you've been taken through the hard facts of the movie making it was time to delve into the alternative Japanese dream world of Isle of Dogs. Upon leaving the forest of film information and learning about the conditions of its making, I've entered a life-sized version of the film's well-known Noodle Bar. The lively hustle and bustle with the smell of fresh Ramen in the air and chatter resembled a Japanese food street in Tokyo. Unfortunately, I can't share pictures of the scenario as something terrible has happened when I started drafting this post. I must have taken over 100 pictures that day and I cut and paste the images onto my work laptop which I no longer have. This is such a nightmare as I didn't take copies and have been retrieving data all afternoon from my SD card - so far no luck. Luckily I saved a very few pictures from my Olympus Pen onto my iPhone for Instagram purposes but it's still very embarrassing, hence why this post only comes with four images from the day. From there, I went straight into a dark section of the main exhibition space which showcased Megasaki City at night. The display was simply spectacular. The amount of detail and work that has gone into creating the set was sheer overwhelming as everything looked so authentic. The model was at least 2x2 meters with skyscrapers, mini houses, trees, cars and many many lights to give a realistic replica of a Japanese megacity. And it wouldn't stop here: there was even more to see and to explore. Original sets such as Trash Island including a deserted fairground, the Noodle Bar, a TV production studio, an Asian bathhouse, a temple, a Japanese sumo wrestling scene, or a laundrette were all easily accessible for you to inspect and enjoy. Of course with Alexandre Desplat's score subtly playing in the background for that added bonus feeling of actually being in the film. It was incredible how close you were allowed to get to the sets and view the meticulous constructions. The rich details and very fine eye for accuracy made these sets standalone artworks. 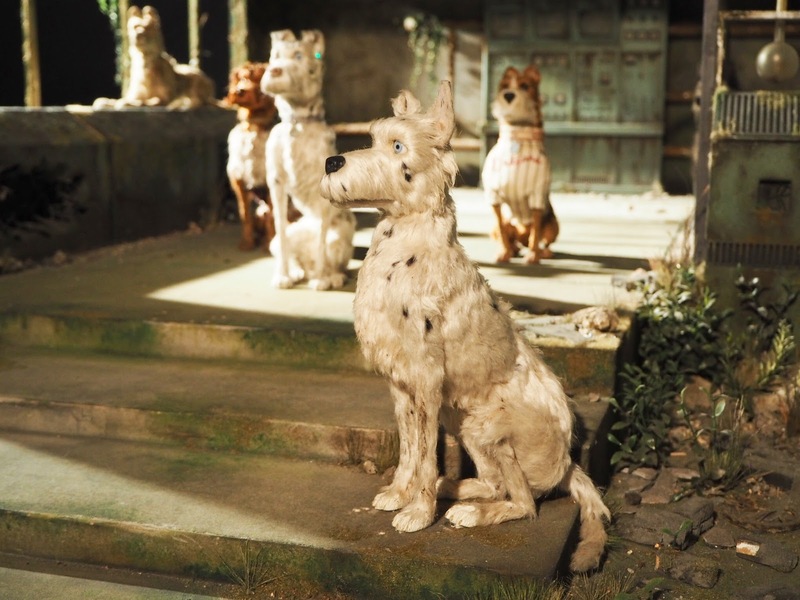 Even without having seen Isle of Dogs I felt I've known quite a bit about the plot and learned much of its main characters. This was certainly a wonderful experience and I wish more film studios would follow this example and make a glimpse behind the scene possible to the general public. The exhibition runs for another week due to the high demand. So far it has been visited by over 3k fans per day which make up for a total of over 40,000. I highly recommend the exhibition as it will take you on an unforgettable journey to miniature Japan and will, even more, excite you to see the movie.